Easy-to-use main window with standard Mac OS X services built-in. All TCP services protected by default. Ability to tune protection on a service-by-service and address-by-address basis. Protect services by name or port number(s). Four protection modes: deny all, allow all, allow by address, deny by address. Setup assistant to help you best secure your Mac's services. Full logging of allowed and/or denied connections on a service-by-service basis. Integrated with our Who's There? Firewall Advisor to help you understand, analyze and react to access attempts. Includes a built-in version of "Internet Security for Your Macintosh: A Guide for the Rest of Us," browsable on a service-by-service or section-by-section basis. Includes direct access to and searching of our blog, isfym.com, blog, Twitter stream and Top 10 list, for information and advice on recent security issues. "Locations" provide different protection settings in different environments. Status menu item available at all times: confirm settings, easily switch Locations. Optional protection and logging for UDP services and ports. Updated with newest service names and ports. DoorStop was the first Macintosh firewall, for Mac OS 8.1 in 1998. Open Door has been shipping security products since that time. 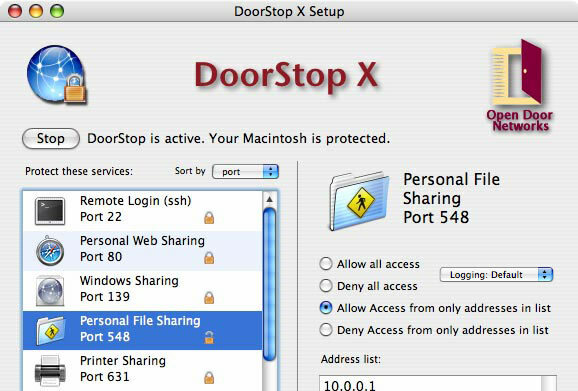 We know how to help you make your Macintosh secure on the Internet. Copyright (C) 2000-2011, Open Door Networks, Inc. Who's There? 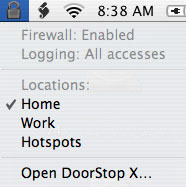 Firewall Advisor and DoorStop are trademarks of Open Door Networks, Inc.